Chocolate Bar with Personalised Wrapper is an Ideal Gift or Game Prize personalised with your special message. We will supply you with a 100g bar of delicious chocolate wrapped with our lovely personalised wrapper. These can be personalised individually with your special message for a unique gift or as fun game prizes for different games you may be playing. 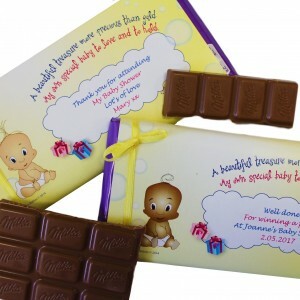 Chocolate Bar with Personalised Wrapper is an Ideal Gift or Game Prize personalised with your special message. We will supply you with a 100g bar of delicious Chocolate (either milk, white or dark) wrapped with our lovely personalised wrapper. Each Professionally printed wrapper is made from a quality gloss paper with a space for us to put your personalisation. If you prefer for this to be left blank for your own special message then please add this into the comments box below. On the reverse of the wrapper is a list of fun & light hearted ingredients to amuse all your guests!! Designed by & Unique to us. Something very special for your Baby Shower Party. We will happily personalise each bar with a different name or message. Please just enter the details into the text box. Please would you also select the colour of ink you would like your personalised message in below plus quantity of chocolate bars you require. Ink colour options are listed below. Each bar is tied with piece of satin ribbon to make this a special prize or favour.